This was the coolest little hole-in-the-wall Ethopian food shrine. While we were waiting (for a long time- this is a popular place), the waitress noticed I was looking peaky and brought me a mug of water and a mini-platter for me & my friends for free. By the time we got around to ordering dinner, we got two humongous platters (vegetarian dips and curries and sponge bread) which served all four of us with leftovers and cost us $20. This place is a classic, I can tell, not only because of the cheap, delicious food, but because of the quirky-yet-authentic communal atmosphere. 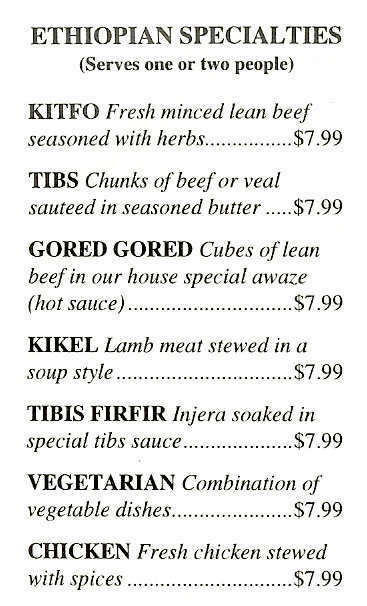 This entry was posted in Dine Under $50, Ethiopian, Recommended and tagged gored gored, injera, kikel, kitfo, tibs, vegetarian. Bookmark the permalink.